Finding the best metal forming process to manufacture your products can be a difficult and time-consuming task. When deciding how to get parts or products made for your company you need to make sure you're picking the right metal forming process. One that offers all of the services and capabilities necessary and leaves you with high-quality parts. To help aid you in your research we've put together a handy decision guide for you to use. 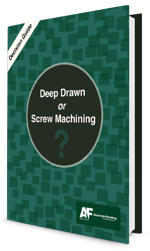 Our guide quickly compares two of the most popular metal forming processes used today. Giving you the information that matters, and ultimately helping you decide on the process that best suits your needs. Our guide will allow you to make your own informed decision on the best metal forming process that suits your needs.